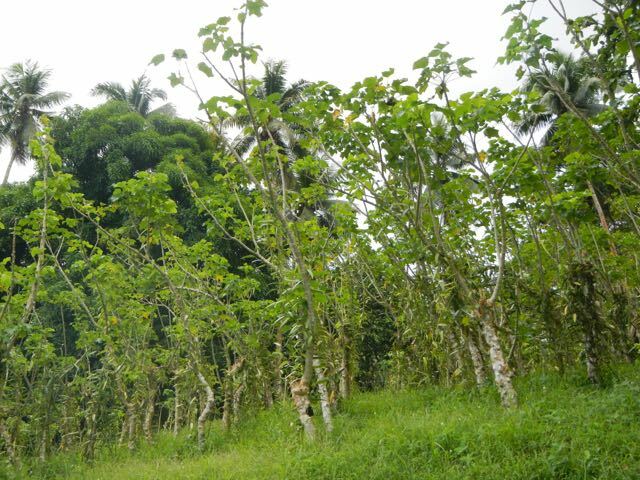 Conni has wanted to see a vanilla plantation for three years, and we were determined that she'd have the chance to visit one this trip. 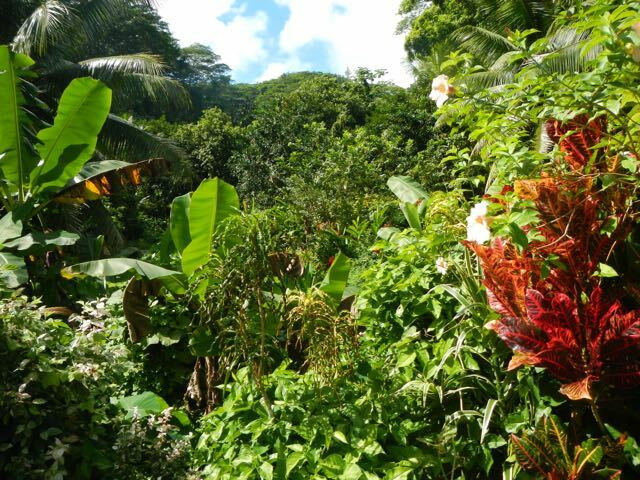 From Ha'amene, it's a walk of no more than two miles, although there was a steep hill to climb and descend. On our return, it rained buckets but we still enjoyed the entire day. To cap off the day, we enjoyed one the most exceptional meals ever, at the Taha'a Maitai restaurant, with owner and chef, Bruno Francois. What a meal! 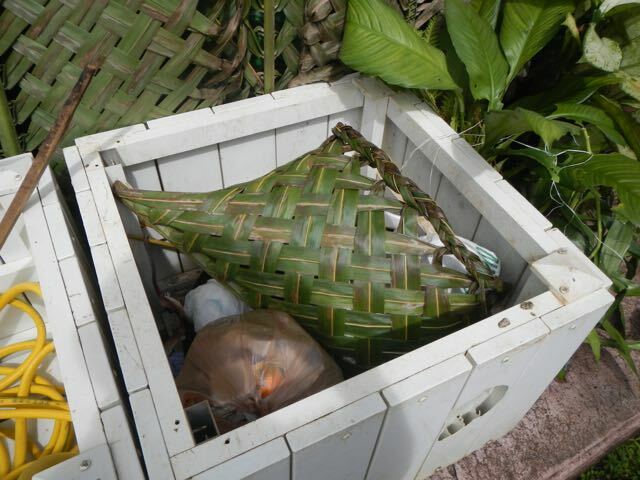 A garbage bin isn't the best photo to offer, but I was amazed by this beautiful hand-made basket that was in the trash. 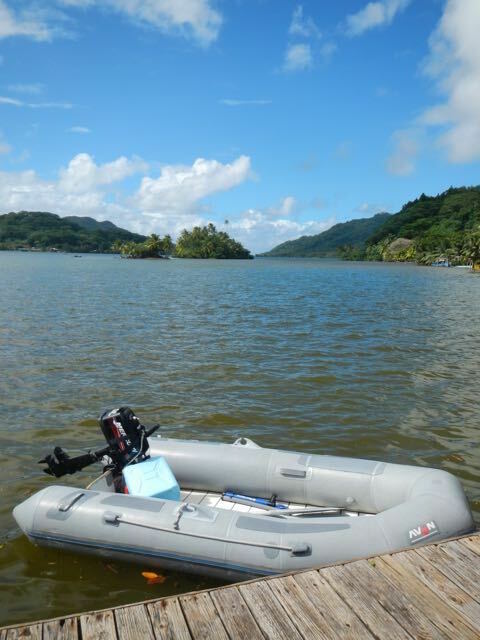 Our wonderful dinghy at the dock in front of Taha'a Maitai. Our almost-new Mercury outboard has certainly changed our willingness to explore by dinghy. 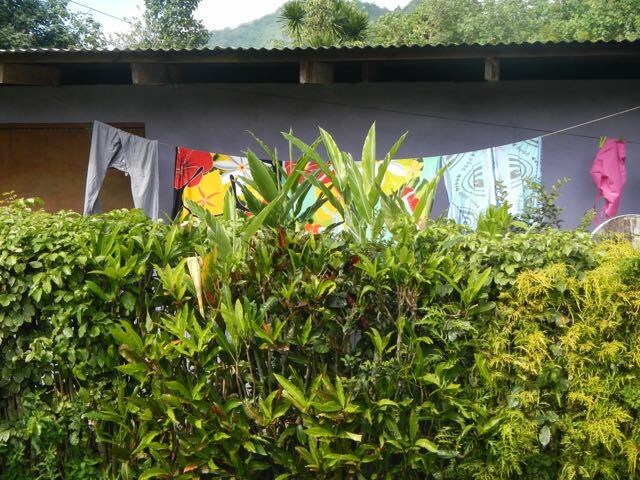 One sometimes wonders at the vibrant colors that the locals wear, as seen in this wash out to dry, until one sees the incredible flowers that grow everywhere. 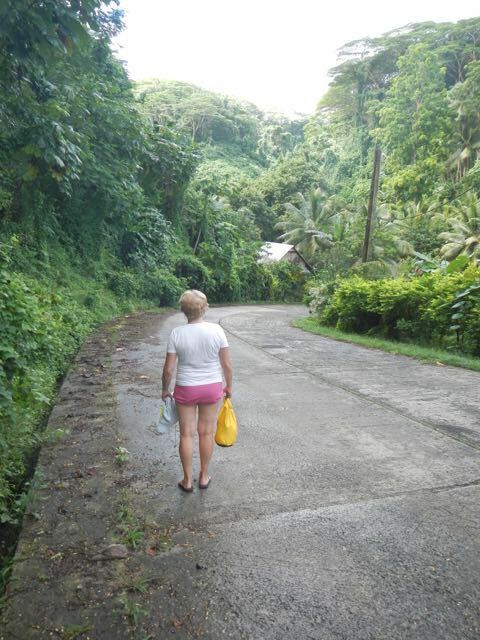 Lovely Conni strolls down the hill toward La Maison de la Vanille. It hasn't rained yet, but it's still like sitting in a steam bath: hot and humid. The growth is so dense, diverse, and beautiful, that I have yet to get tired of snapping photos. 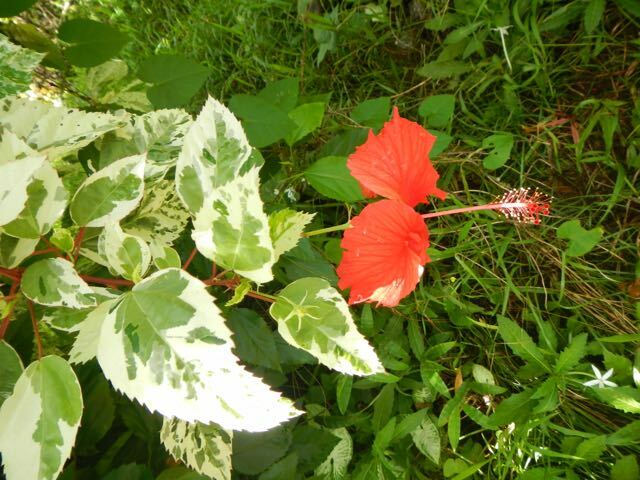 We have no idea what kind of plant this is, but it's got variegated leaves and scarlet flowers. 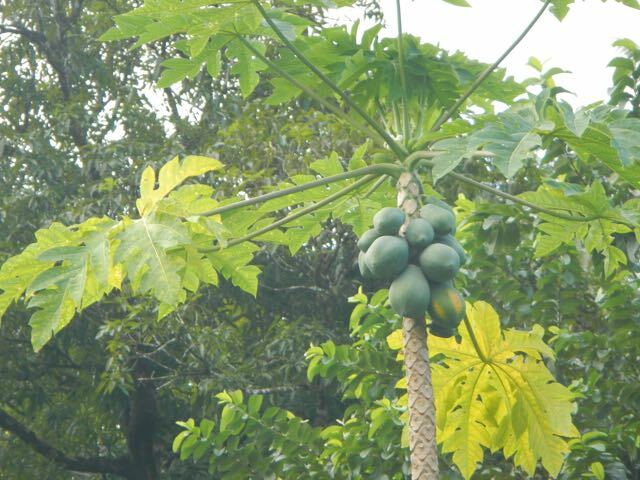 We think that these are papayas. We've just never seen them grow before. We're here! 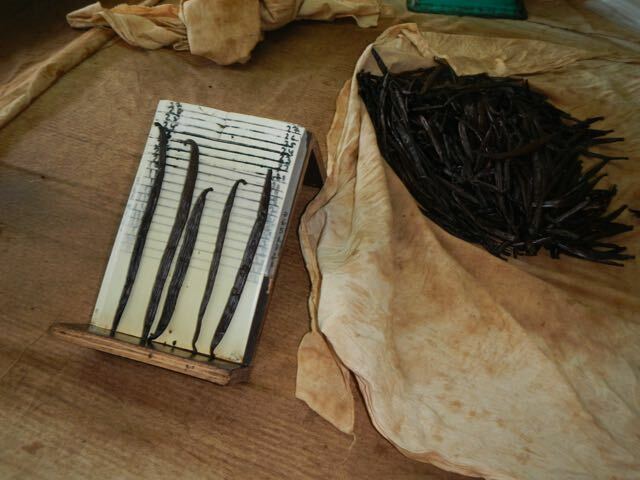 A single family owns and works this "plantation" for growing, harvesting, processing, and selling vanilla pods. 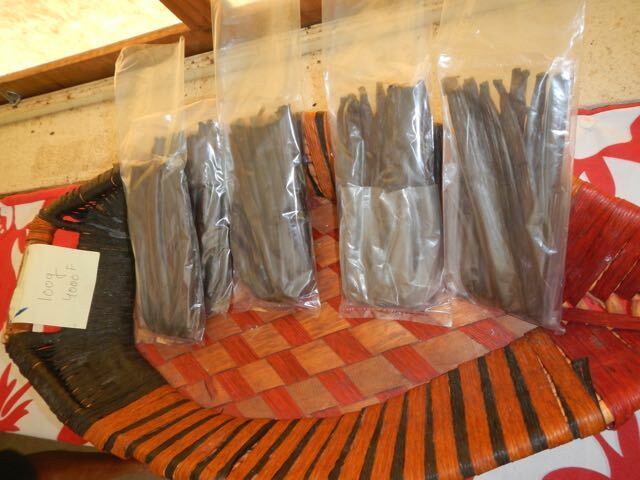 Since only a dozen of these pods is about US$100, this is worth of a lot of money! 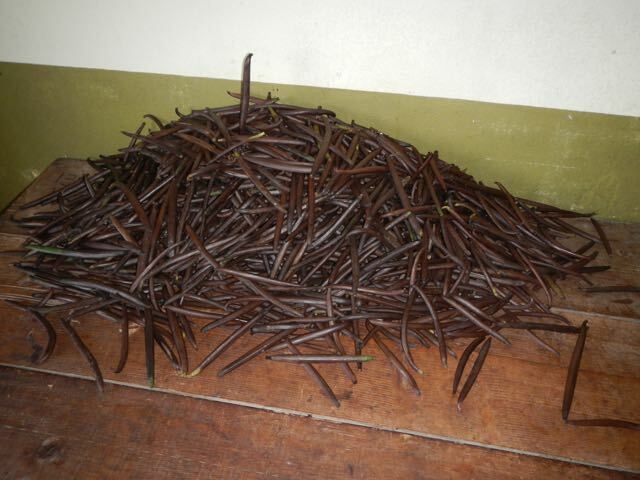 This is a pile of ready-to-sell vanilla pods. 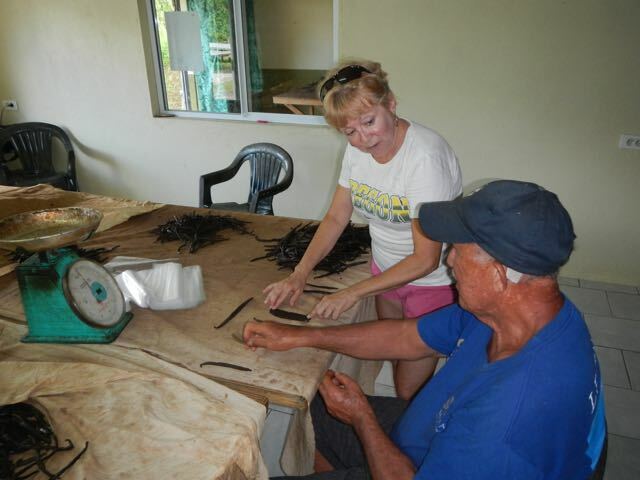 Directly after picking, vanilla pods are green, of course. 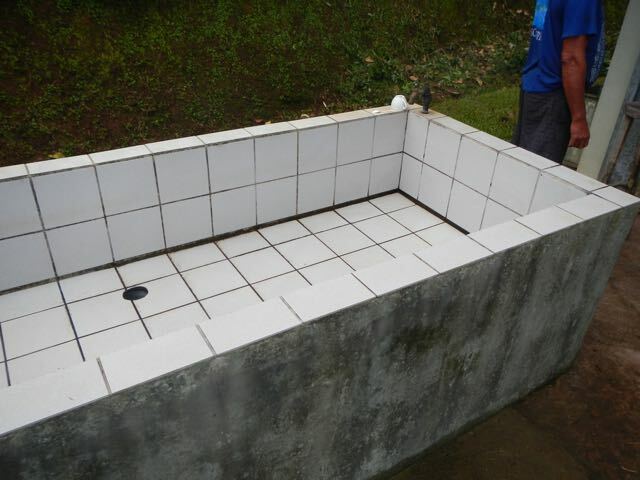 After harvesting and removing trash, they're washed by hand in the big tile basin. These are the drying racks for the pods. They're kept on the cloth so that they can be removed quickly if it looks like rain. 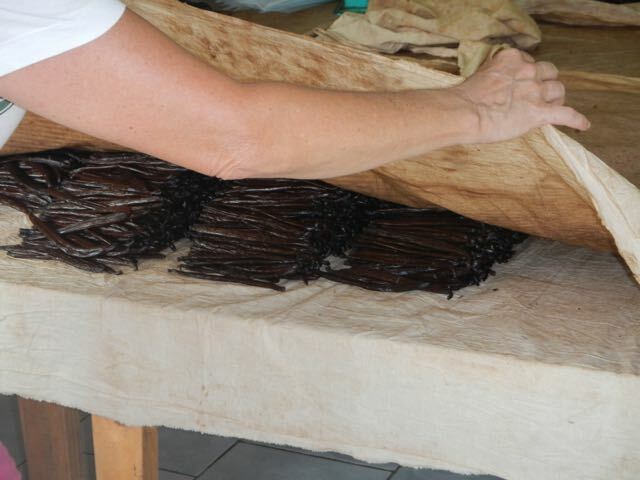 The pods are dried in the sun for 5 months: every day carried to the sun, every night returned to the sheds and examined. 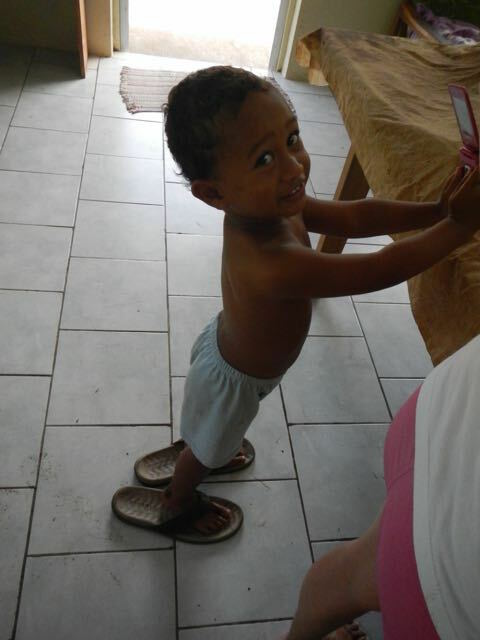 The owner's grandson does not fill my sandals. He was quite the pistol, though, and made himself annoying enough to attract our attention. Sizing the pods is important work. The larger ones are, of course, more expensive, probably because they're sold as pods. Smaller ones are processed for food, cosmetics, alcohol flavoring, and other uses. Conni and the owner discuss the process. 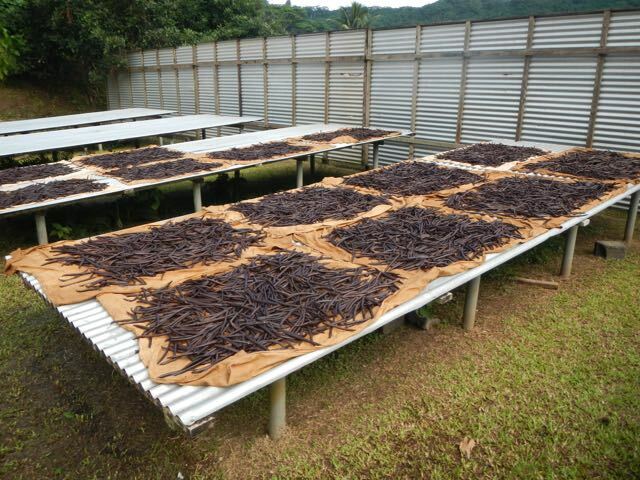 We peaked under this cloth and found thousands of pods sorted and ready to sell. 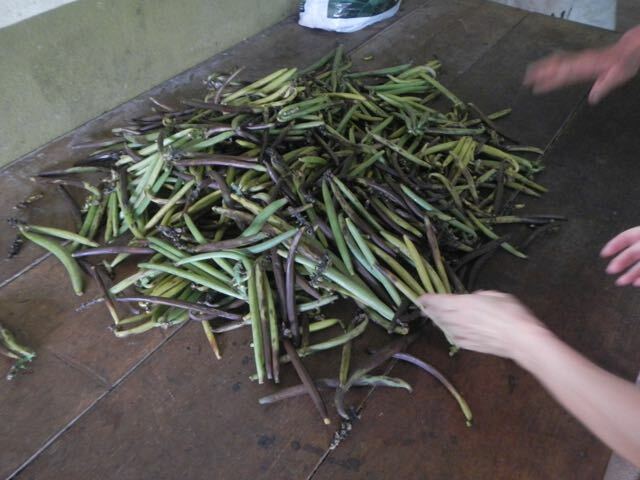 These beans cost US$38 for 100 grams, so not inexpensive. Truly, with all of the hand labor involved, it's no surprise. Vanilla plants growing! 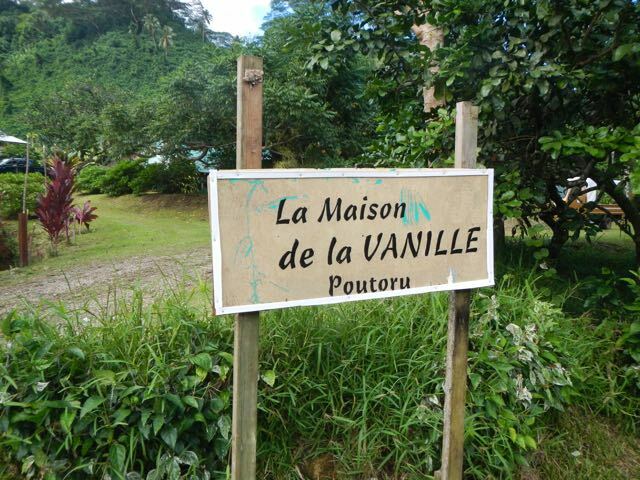 This is a vanilla orchard! 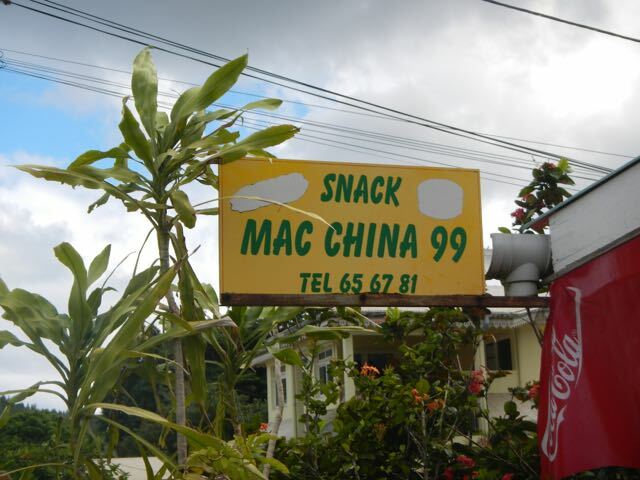 After enduring the rain on our return from the vanilla tour, we walked past this Snack and decided to partake. 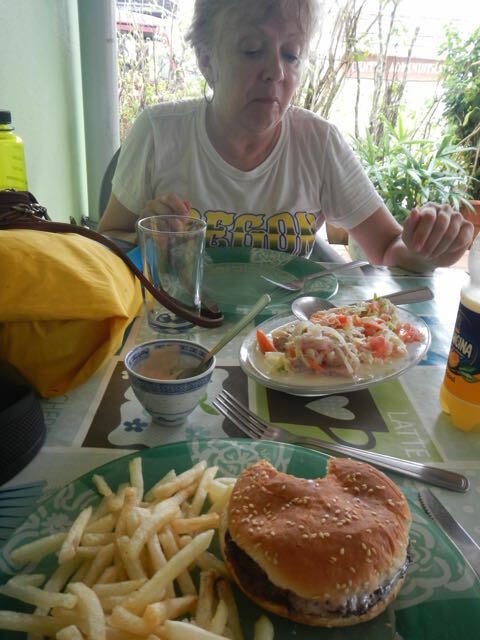 Predictable Bill got a hamburger and fries, while Predictable Conni got poisson cru. This is the sign for our little lunch stop. I have no guess on the meaning of the name. Our meal at Taha'a MaiTai began with these fabulous drinks. 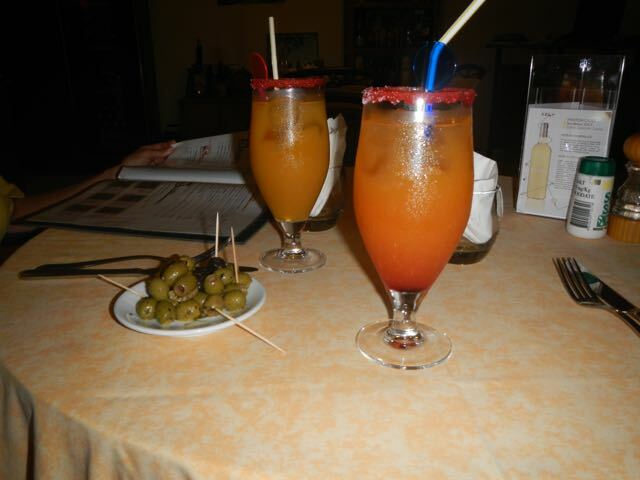 The closer one is mine: a Maitai, of course. Conni selected a Taha'a Dream. 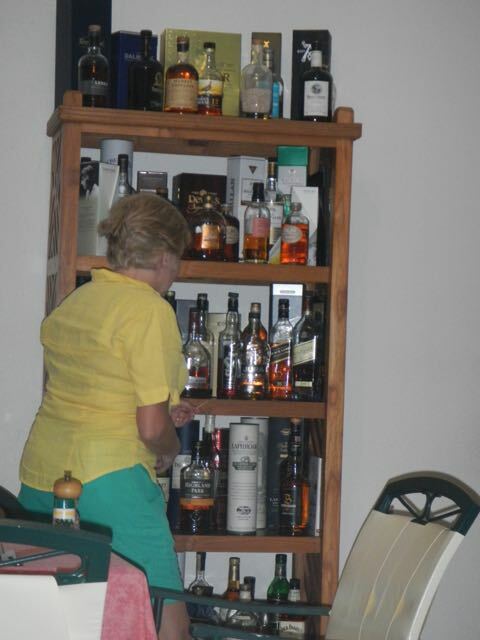 As we await our cooked-by-hand meals, Conni investigates the 60+ brands of whiskey and Scotch. 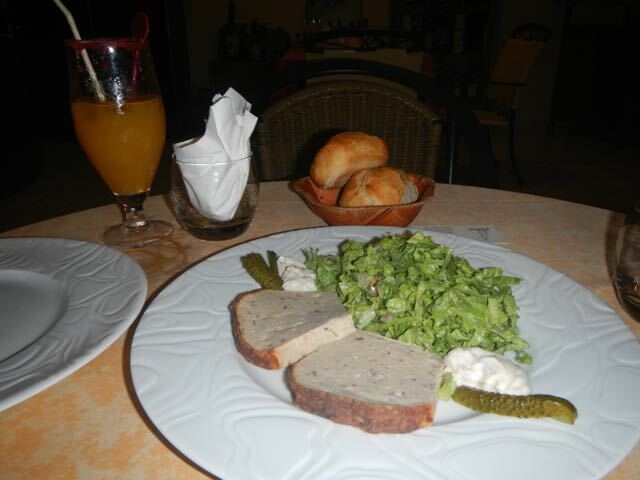 Poisson pate, fish pate, doesn't sound good, but is delicious, especially with the homemade mayonnaise. 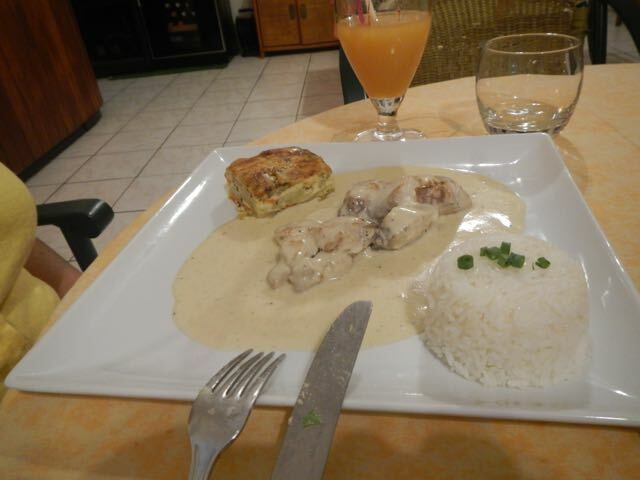 Conni's meal was Mahi-mahi in vanilla sauce and was superb. We've learned that vanilla and white fish pair well. Bill's meal was pork with coriander and lime juice. 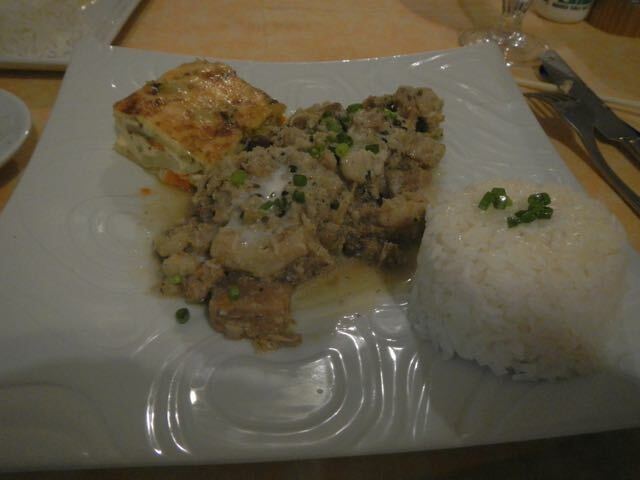 The little gratin was potatoes, carrots, and lots of Herb de Provence. Bruno the chef told us that the preparation was his take on a typical Thai dish. 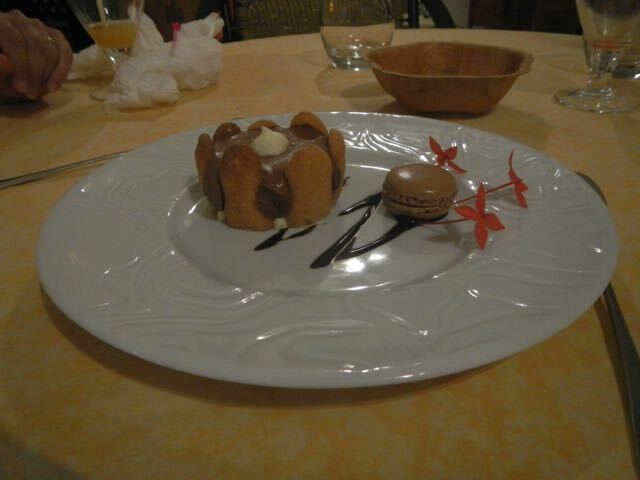 Bruno's dessert was lovely and tasted even better. A mixture of white and dark chocolate, it was beautifully prepared and decorated.